St. Peter and Paul is sometimes called 'The Italian Cathedral of the West.' The church is administered by the Salesians of St. John Bosco, who were originally sent to San Francisco to minister specifically to the Italian immigrant population in 1884. Their first church at the corner of Filbert and Grant was destroyed in the 1906 earthquake and fire. 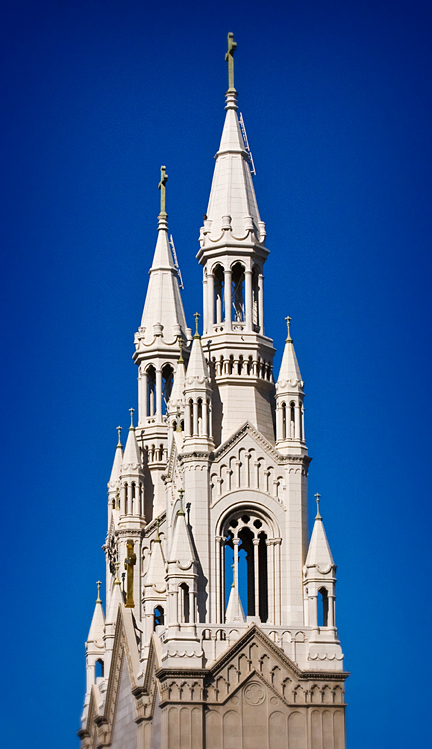 This Romanesque church with its 191-foot spires was designed by Charles Fantoni in 1913 and dedicated in 1924. This church is considered one of the most beautiful in the city. The high altar is made from Carrera marble and weighs 40 tons. The stained glass rose window is 14 feet in diameter. Masses at St. Peter and Paul are held in English, Italian, Latin and Chinese.